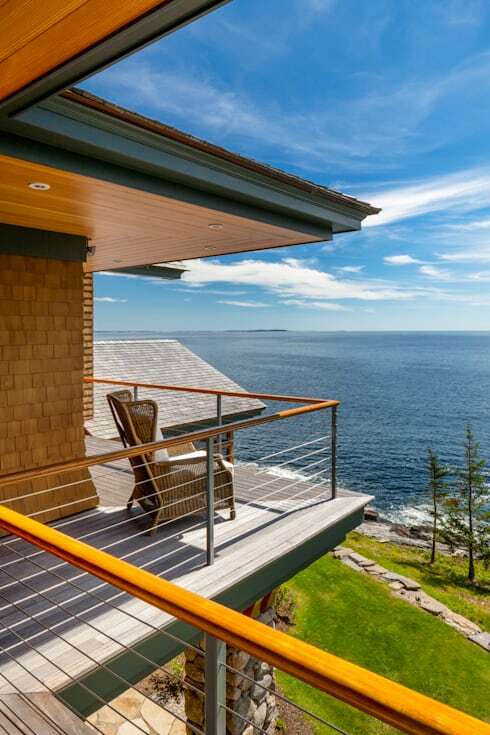 On the wild and rocky coast of Maine, the architects from John Morris Architects have made a beautiful addition to the seaside landscape with this refreshingly natural ocean cottage. Prizing the views and fresh air above all else, this summer home features a series of cantilevered decks that wrap around three sides of the home’s 3015 square footprint. 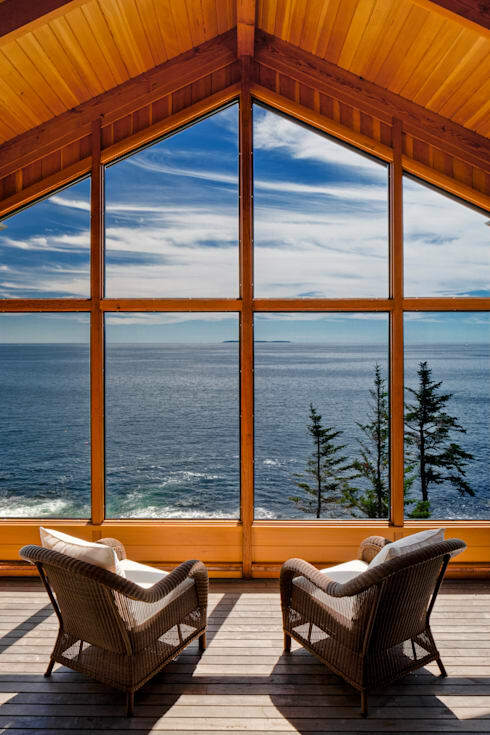 Many of the rooms face the sea with wide, floor to ceiling windows, turning the panoramic views in the distance into the very artwork of the home’s transparent walls. Special care has been given to keep the interior clear and uncluttered – despite a modest square footage, the cottage retains a sense of spaciousness due to mindful furnishing style that values breathing room over rooms full of accumulated furniture and decor. Gain a sense of cheerful, summertime ease as you tour of this rural, eco-inspired cottage on the gorgeous Northeast coast! The structure has been designed with consideration for both the natural topography of the site, in addition to the natural materials found in this particular microclimate. 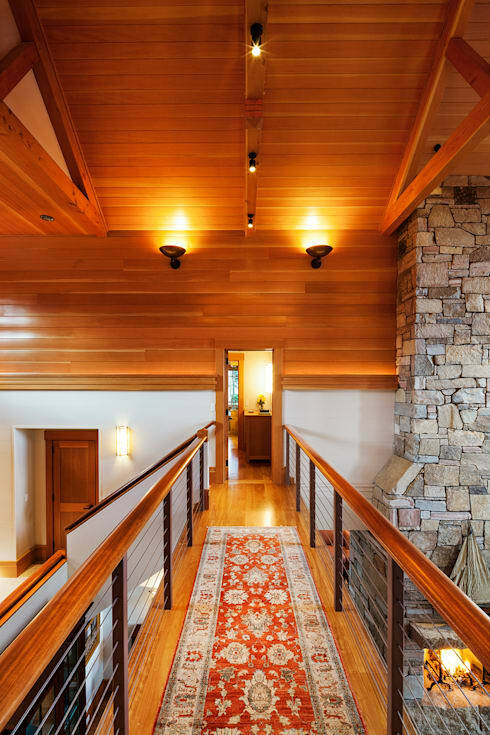 The architects have included stone walls on the lower level, anchoring the home into the slope with a highly fitting choice of materials. Likewise, the abundance of pine that grows in the area is reflected in the wood cladding found on many exterior areas of the home. An extensive series of decks wraps around the outer edge of the home on three sides, another feature that communicates openly with the surrounding natural world. With open windows and large decks facing the seaside slope, the back of the home serves as the access point. 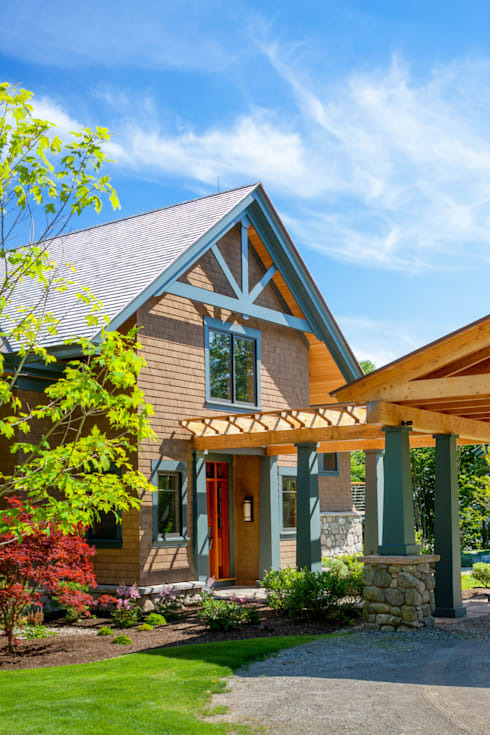 A friendly colour scheme in variants of primary colours gives off a playful feel, while a trimmed gable roof conjures up imagery of a traditional rural cottage. This sunlit area is designed to soak up the amazing view – with much of the slope dropping away underneath the home, this room appears to soar out over the breaking waves, instilling a sensation of lift, expansion, and freedom. From the private rooms on the upper floor of the home, residents can enjoy a bit of fresh air by accessing the wooden decks present on three sides of the structure. Designed to be inhabited by both guests and the owners of the home, the upper floor offers an owner’s wing on the North side, with ensuite guest rooms on the South. The building itself is made using new technologies, but this living room is meant to create a vision of those “days of old”. 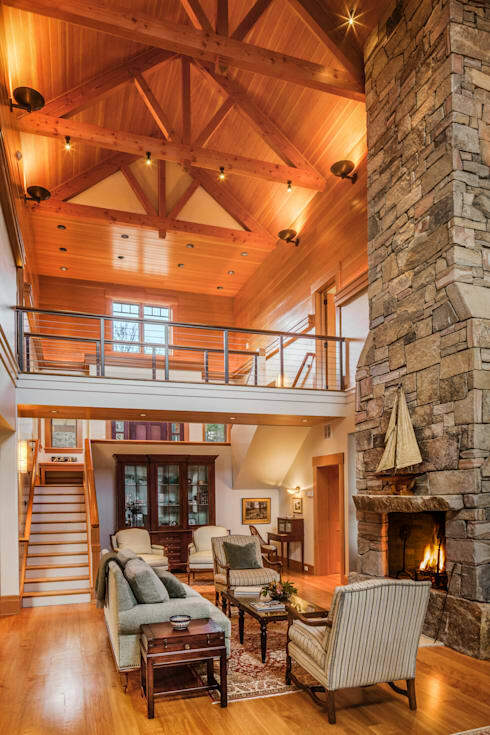 A classic cottage scene composed of antique furniture gathered around a stone fireplace keeps things cozy, while above, an open upper floor hallway draws attention to the impressive volume of the room. Here, a view from the upper floor walkway shows how the feature connects the two separate living spaces of the home (guest wing and owners’ wing) in an arrangement that gives each section a distinct part of the house all its own. Once on the walkway, however, both the guests and owners enjoy an instant welcome to the common area as they become surrounded by open space on all sides. 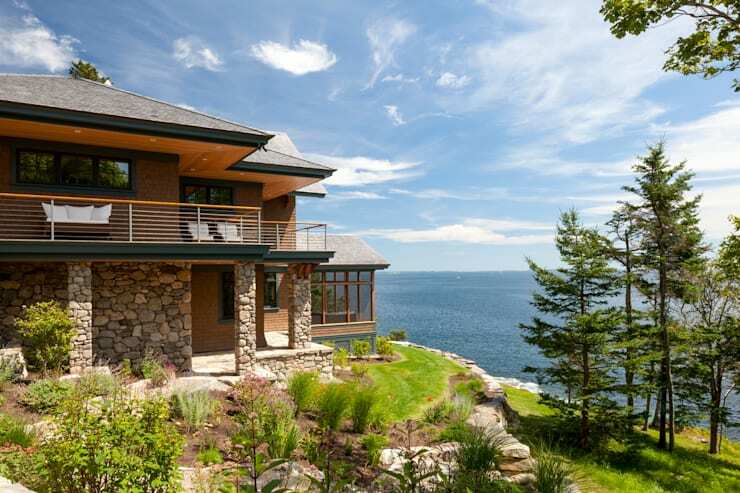 Share your thoughts on this coastal house below!